When accounting for capital gains and losses in the securities market, understanding reporting responsibilities and potential reductions is critical. Capital gains and losses must be reported to their respective countries for investments in debt, equity, and derivatives. When an investment is sold in the market for a loss or gain in a given reporting period, that investment must be reported as income on the income statement. When an investment is held over the reporting period, it is an asset on the balance sheet and reported accordingly. There are a wide variety of tax reductions on certain investment types, and understanding the existing legislation for reductions or deferments can be a significant value add for organizations. capital gains: Values captured from the trade of assets on the securities market. Securities: Assets purchased in the securities market, such as equity, debt and derivatives. 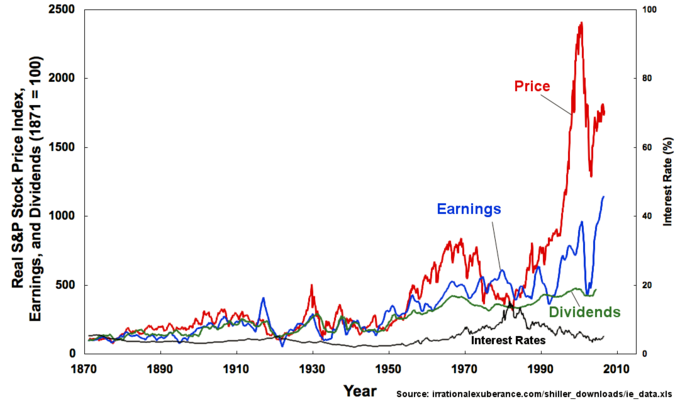 Stock Price Index Over Time: The securities trading markets have appreciated substantially in recent times, making the scale of investments (and subsequent reporting) more important than ever. When considering the returns derived from these various investments, organizations and individuals must be aware of the reporting obligations in the country in which those securities are traded. Organizations like the IRS have a wide variety of taxation requisites depending upon different investment situations, and understanding these regulations is critical to ethical trading and adherence to legalities. Most commonly, reporting of investments will fall under the reporting of capital gains. Both organizations and individuals must report any and all capital gains within a given time period. These capital gains are profits derived from the sale of investments, which is to say that existing investments where capital is still tied in the underlying asset it not taxable (though it must be reported on the balance sheet for organizations as assets). When profits from short term investments are derived in a taxation period for an organization, this profit is reported on the income statement and taxed accordingly. Capital gains taxes can differ based on the duration and type of investment made, but for the sake of this discussion it is enough to understand that an existing investment is an asset on the balance sheet and profit from the trade of an investment should be reported as profit (or loss) on the income statement. In some countries, specific industry investments receive tax breaks to stimulate economic growth. For example, an investment in new green technologies is often a source of potential tax break, as it is beneficial to the broader economy and world at large. Retirement investments are often tax free (until withdrawn) to stimulate responsible saving and retirement planning. This allows companies to accumulate interest on what would’ve been taxable income until the capital is removed from the account. The sale of an asset at a loss is often a tax deductible, as are other capital losses. Donations of assets or capital to charity are tax deductible in most situations. Occasionally, the acquisition of certain assets will have the value reevaluated. In such situations, the difference between the original price and the new price may be a source of tax deduction. While there are countless other small legislative items which may indicate tax implications on capital gains, this gives a reasonable overview of the types of considerations accountants make when considering capital gains. Dollar returns are useful for determining the nominal amount that the firm’s assets will change. Dollar Profit/(Loss): The dollar return is the difference in value from year to year, plus the previous dollar return. internal rate of return: IRR. The rate of return on an investment which causes the net present value of all future cash flows to be zero. return on investment: ROI. The dollar return of the investment divided by the initial value. compound annual growth rate: CAGR. A method for finding the average annual return of an investment. In, the ROI is calculated for each individual year by dividing the dollar return by the initial value of $1,000. To find the return for the security overall, simply sum the dollar returns and divide by the initial value. The ROI can be annualized by dividing by the number of years between the purchase and sale of the security. This is the arithmetic mean of the return. Cash Flow Return: The ROI is the percentage return, and is calculated by dividing the dollar return by the initial value of the investment ($1,000). Another common method for finding the annual return is to calculate the internal rate of return (IRR). Recall that the IRR is the discount rate at which the net present value (NPV) equals 0. ” Animal spirits ” describes general investor sentiment which can affect markets, even without changes in the underlying financials. animal spirits: After Keynes (citation 1936, above), the emotional and intuitive factors that drive business decisions whether to make investment gambles. volatility: A quantification of the degree of uncertainty about the future price of a commodity, share, or other financial product. systemic risk: The risk of collapse of an entire financial system or entire market. Historical analysis of markets and of specific securities is a useful tool for investors, but it does not predict the future of the market. There are general trends and expectations of future behavior, but they are just generalizations. For example, the Dow Jones Industrial Average (DJIA) has generally followed an upward trend from 1900-2009. However, an investor who looked at this graph in early 1929 and made the decision to invest because s/he would be guaranteed to make money was in for a shock when the market crashed in October 29, 1929. Past performance is not a guarantee of future performance. DJIA 1900-2009: The Dow Jones Industrial Average has generally increased overall since 1900, but its past performance is not a guarantee of future performance. Inherent in all markets is something called “systemic risk. ” Systemic risk is the risk of collapse of an entire financial system or entire market, as opposed to risk associated with any one individual entity, group, or component of a system. Macroeconomic forces, such as the Great Depression, affect the entire stock market and can’t be predicted from past market performance. The failure of one company affects all the companies who purchase from it or sell to it, which in turn affects all the companies that rely on them. These types of interlinkages are a cause of the overall market variability and volatility. Average return on investment (ROI) is the arithmetic average of the total cash returns divided by the initial investment. It is useful for quick calculations and specific securities (such as bonds purchased at par ), but does not account for compounding returns. compounding returns: Returns earned on previous returns. Akin to compounding interest. The internal rate of return (IRR) is another commonly used method for calculating the average return. IRR is the discount rate at which the net present value (NPV) is equal to 0. Using IRR allows for easy comparison between investment options. It is also known as the effective interest rate. 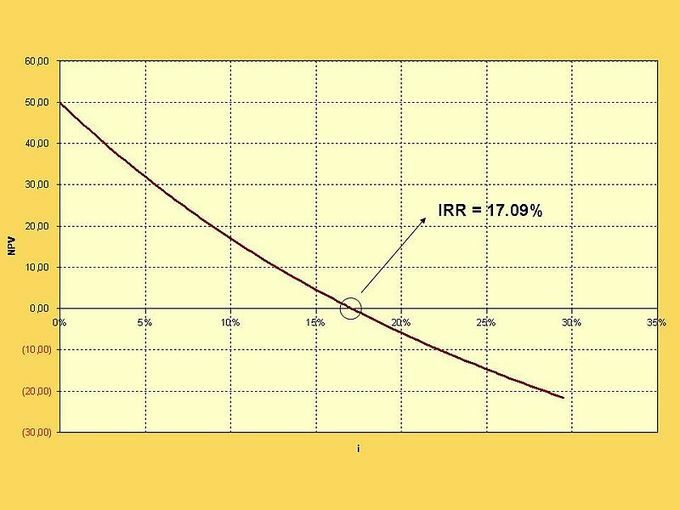 Internal Rate of Return: The IRR is calculated by finding the discount rate at which the NPV of the investment equals 0.